On Thursday October 18th, Openhouse and Google Play hosted the Google Musicians Gallery, a special showcase event for CMJ badgeholders, musicians and industry guests. On June 30th-July 1st, Bing and Big Think presented the ForHumankind pop up highlighting some of the most innovative companies around. The pop up presented Hux, Bodega Algae, Kimetric, Soccket, Sonar, Styku, Open Source Ecology, Plant-In The City, The Not Possible Foundation and Zero Touch to guests through interactive displays. Check out the pics courtesy of Solifestyle. Streetwater + Flavorpill + HowAboutWe’s ART=MIXX July 12. Live jazz, live art auction, art market, summer cocktails. Check out the pictures, courtesy of Startle. 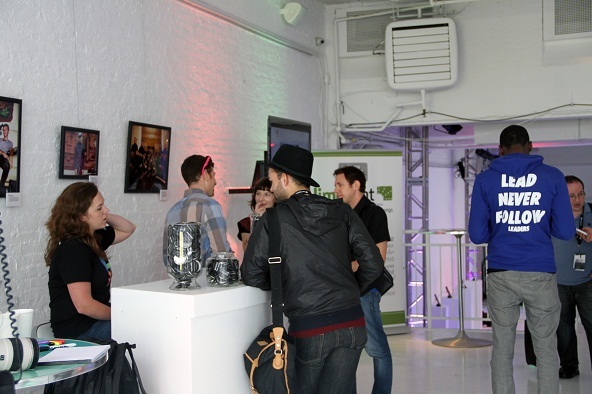 CNET hosted its first-ever pop up at Openhouse Gallery. The space was built out by Production Glue and the entire event spearheaded by experiential firm MKTG. Check out the pics, courtesy of MKTG’s Diane DeRousseau. CNET Gotham 11/9-11/13: Nerd Nite speed dating, photo tours, app lessons, editors’ holiday guide, parties, pick a tablet! CNET Gotham runs from Wednesday 11/9-Sunday 11/13 and is open daily from 11 am-7 pm. Featuring CNET personalities Lindsey Turrentine, Moly Wood, Sharon Vaknin, Brian Cooley. Food by Sweetery + Korilla BBQ. The best indoor grass in the city is back! The Arab Spring is over, Sheep’s Meadow is dead, winter is coming, but Openhouse’s revolutionary pop up brings summer back to winter again. Featuring photographs from the New York Daily News, New York Times, Star-Ledger and other metro-area papers, the Year in Pictures shows off more than 200 photos. The exhibition is open to the public today through Sunday from 12 pm-8 pm. The New York Press Photographers Association hosts The Year in Pictures Thursday through Sunday from noon-8 pm. Explore some of the pictures the NYPPA will be featuring. Pictures from The Last Magazine’s The Last Space pop up during Fashion Week 2011. “We have begun to think about a shift in perspective away from just the printed page toward actual experience and human interaction,” write founders Magnus Berger, Jonathan Shia and Tenzin Wild.